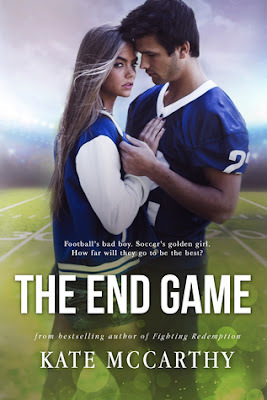 I thoroughly enjoyed this one; it was not at all what I was expecting from a “Sports Romance.” This was a sports romance with a twist, it was great that the heroine was also a sports star too, with this book we have a successful woman as well as a successful man and it brought a whole new dynamic to this trope in sports romance books. Kate McCarthy painstakingly draws you into the lives of Brody and Jordan and what I loved was that this wasn’t so much about the glamour, fame and fortune that success on the football pitch brings but this centred around the pressures to succeed and also how far you would go to match up to those expectations afforded to you by family, peers and fans. Brody Madden was the typical high school jock, except he wasn’t. He gave off those vibes in all the right places but really the reputation had no resemblance to the man himself. He was the man that all women wanted to be seen with and who all men wanted to emulate but if they really knew the real Brody Madden...would they want to be him? Brody has the most unsupportive family...ever!! They wanted him to follow in the family footsteps, his father was a politician and his mum a society wife but it was apparent from a young age that was not going to happen. Brody had dyslexia and rather than get him the help and support that he needed, they brushed it under the carpet as an embarrassment, so Brody had to struggle all the way through school and college. It was amazing that he had made it this far. Now with his football career hanging on by a thread due to failing grades, drastic times call for drastic measures, I was just grateful that he had a supportive uncle, who fortunately was in the right place at the right time. Jordan Elliott was the poor girl that had an affinity for football. She was at the top of her game in Australia and this had led her to be scouted by one of the top ladies soccer colleges who had brought her to the States on a scholarship. She had high expectations and the lives of her and her twin brother depended on her being successful. She has one goal and that was to succeed and get signed. Jordan was a great character, she was strong, she was motivated and she knew what she wanted and how to get it but on the flip side she had a heart of gold and was sympathetic and empathetic. While her past may have dictated her future she had never let it get the better of her and if anything the bond that she had with her brother was even stronger and even more endearing. These two only had each other and with many sacrifices made Jordan needed this to work. Brody, Brody, Brody, I felt so sorry for Brody, all he wanted was to be loved but in return he got nothing. My heart broke for him so many times but pressures also made him make some stupid choices. Pressures from outside forces and even from himself led him down a shaky path and one that was only ever going to end badly, but he wanted to be someone, he wanted his dad to be proud rather than embarrassed, he just wanted to be accepted, just how far would he be willing to go? Jordan and Brody’s paths cross when one of their professors marry them up for tutoring, Jordan having tutored her brother with dyslexia was the ideal candidate to help Brody and also they had sport in common, they understood each other’s pressures. While they didn’t necessarily get off on the right foot, it soon became apparent they had a lot more in common. Kate McCarthy really delivers on the emotion, the character build up and connection for me was on point and these two totally endeared themselves to me. My only little niggle was that in some places for me the story dragged and my interest began to wane a little, but then something else would happen and we would be back on track. As usual with a Kate McCarthy read you could not help but be drawn into this story, I felt it all, the conflicted thoughts, confusion, the pressure, the pain, the love, the hate, the fall outs and everything else in between. These two really had it rough but at least they had each other. At times they both needed tough love and they both delivered it and were on the receiving end, but that went a long way in showing just how much they meant to each other and how perfect they were together. They could read each other, they knew what the other wanted and needed and whether they initially wanted it or not their connection was soul deep. These two truly were soul mates. Another great read from Kate McCarthy, this is one author that knows how to deliver an emotional punch and this one is no different.